Posted on October 27, 2015 by Joseph Alban, L.Ac. According to acupuncture, not all people get IBS for the same reason. This makes sense, as everyone is different. And so, a course of treatment should specifically address what you are experiencing. It also makes sense for IBS in particular, because there is no single cause of IBS for all people. [4,5] IBS Factors include issues with gastric motility, low-level inflammation in the digestive system, and dysbiosis, an imbalance in gut bacteria. Some people have issues with specific food triggers. Of course, many people find stress a significant factor in the development of IBS. Acupuncture has long understood that toxins remain after infections. The therapy focuses on removing these toxins, correcting the imbalances causing the problems, and boosting the body’s energy. Acupuncture and Chinese herbal therapy are helpful for all types of IBS to relieve pain and discomfort, regulate bowel movements, and improve overall health. During your first visit,, we will discuss your digestive symptoms as a part of your overall health. Your sleep, joint and muscle pain, stress, frequency of colds, and energy levels all help me to understand what is causing your particular digestive issues. Unique to acupuncture, feelings of heat and cold reveal an underlying cause of heat (which is often inflammation in the gut), lack of circulation, or poor digestive energy. The acupuncture and Chinese herbal therapy are customized to each person’s unique combinations of symptoms. By considering all of your symptoms and your overall health, I will identify the imbalances that are the root cause of the IBS. 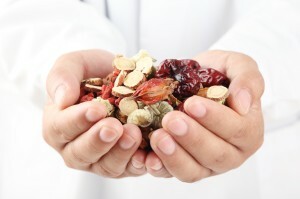 The acupuncture and herbal therapies are customized to address the imbalances underlying the IBS. The most common imbalances leading to IBS are a lack of digestive energy (Qi vacuity), lack of flow of the energy (Qi Stagnation), as well as accumulation of toxins in the digestive system. Different acupuncture points and herbs will be used for the different imbalances. Acupuncture of course also works physically on the body to improve digestion and gut motility. One technique is electro-acupuncture on the point Stomach 36 which has been shown to regulate gastric motility. Once the gut motility returns, the natural gut microflora will be more likely rebalance. In my practice, I find that trigger points throughout the abdomen cause IBS symptoms. Trigger points are areas of hypercontraction of the muscles and fascia, the body’s connective tissue. The trigger points become extremely tight and pull on the abdomen and the digestive system. Relieving this abdominal tension helps to reduce pain and improve IBS symptoms. Herbs are also tailored to each person’s imbalance. Chinese herbal medicine have been shown not only to reduce symptoms of IBS but also have a long lasting improvement of pain and digestion after the therapy has stopped. Chinese herbs are prescribed in formulas consisting of many herbs that each have a specific action addressing the root cause of the IBS. There are a two simple things you can incorporate to your daily routine that can help you feel better. Acupressure at ST 36 can help reduce some IBS symptoms. I tell my patients to massage this point daily for 30 seconds. It is said that after 100 days you can see digestive and health improvement. Chew 20 times. It seems too simple but chewing your food thoroughly actually helps reduce bloating. Digestion begins in the mouth. Chewing make the food easier for your digestive enzymes to break the food down. And saliva softens and begins digestion of carbohydrates. Bharucha AE, Chakraborty S, Sletten CD. Common Functional Gastroenterological Disorders Associated With Abdominal Pain. Mayo Clin Proc.2016;91(8):1118-1132; PMID: 27492916. MacPherson H, Tilbrook H, Bland JM, et al. Acupuncture for irritable bowel syndrome: primary care based pragmatic randomised controlled trial. BMC Gastroenterol.2012;12:150; PMID: 23095376. Bensoussan A, Talley NJ, Hing M, et al. Treatment of irritable bowel syndrome with Chinese herbal medicine: a randomized controlled trial. JAMA.1998;280(18):1585-1589; PMID: 9820260. Rajilic-Stojanovic M, Jonkers DM, Salonen A, et al. Intestinal microbiota and diet in IBS: causes, consequences, or epiphenomena? Am J Gastroenterol.2015;110(2):278-287; PMID: 25623659. Bokic T, Storr M, Schicho R. Potential Causes and Present Pharmacotherapy of Irritable Bowel Syndrome: An Overview. Pharmacology.2015;96(1-2):76-85; PMID: 26139425. Chey WD, Kurlander J, Eswaran S. Irritable bowel syndrome: a clinical review. JAMA.2015;313(9):949-958; PMID: 25734736. De Giorgio R, Volta U, Gibson PR. Sensitivity to wheat, gluten and FODMAPs in IBS: facts or fiction? Gut.2016;65(1):169-178; PMID: 26078292. Pimentel M, Chang C. Inflammation and microflora. Gastroenterol Clin North Am.2011;40(1):69-85; PMID: 21333901. Campbell AK, Matthews SB, Vassel N, et al. Bacterial metabolic ‘toxins’: a new mechanism for lactose and food intolerance, and irritable bowel syndrome. Toxicology.2010;278(3):268-276; PMID: 20851732. Li H, He T, Xu Q, et al. Acupuncture and regulation of gastrointestinal function. World J Gastroenterol.2015;21(27):8304-8313; PMID: 26217082.